Home > My Life Musings	> Numero Uno! It’s Wednesday and it’s time for Friday Fictioneers! Except it’s not because I’m having problems thinking of a story. Woohoo wahey wahooie! I’m numero uno! Top dog! Head honcho! Prime, um, rib! Hang on, wait a second. Other persons also have this award? Am I not the single winner, selected from six billion for my awesomeness? I am, however, happy and delighted to receive this award. It comes to me courtesy of Merbear over at Knocked Over by a Feather. Thanks, Merbear! Here is my acceptance speech. It’s rather long, I’m afraid. Here are the rules, for every award needs rules. I shall do this at the end of my post. This is me doing just that! I’ll let them know in a bit – I’m busy at the moment writing my acceptance post. Ooh, a special Facebook group for the chosen few! Sorry, that wasn’t suppose to sound sarcastic. I’ll head over there in a bit. I’ve already done that, aren’t you paying attention? Here are my nominations. I’m only doing three as I’m trying to watch Dexter, leading to a splitting of my attention. Please don’t feel obligated to accept, it is up to you! AliceAtWonderland – I think Alice has already got a couple of nominations for this, but that’s the beauty of it. You can collect those stars around the outside – one for each nomination! In fact, although it looks like I’ve only got the one star, I’ve already clocked mine. I’ve gone round and started again! Honest. Anyway, Alice is not only totally amazeballs, she’s amazeballs with a generous dollop of awesomesauce on the top! Rarasaur – what can I say about the amazing Rara, except that she deserves every award, follower and commenter that comes her way. And not only that, she wanted an official DraliDoodle for her art page, so she has great taste in quality art :-). Evil Squirrel – although he beat me at Alice’s Sparkleponies contest (no, I’m not letting that go any time soon), his flashback posts, retro ads, cartoons and ever popular “Saturday Squirrel” feature earn him my vote! There are many, many others who deserve this award, but like I say I’m trying to watch Dexter and I suspect he’s about to kill again so I’ll sign off there. Congratulations to our lucky winners, and especially to me. Because I won it too. I just got my first too, but I’m not doing anything about it until after I finish with this marathon blogging month. Congratulations!! You’re nearly there. I admire all you people who managed to keep the momentum up during November! Thank you so much, though I really don’t deserve to be listed with both Alice and Rara! Congrats on being the bestest blog of 2013! 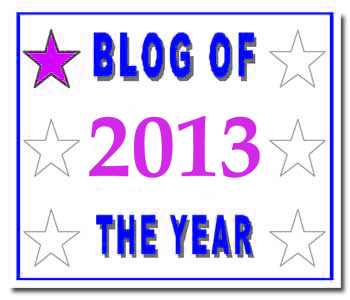 Of course you do, for don’t forget, you’re now also the bestest blog of 2013! Good Grief, OMG, WTG, congrats to you. I’ve been on a or still am on a blogcation, it’s nice to see your doing well. You deserve it!